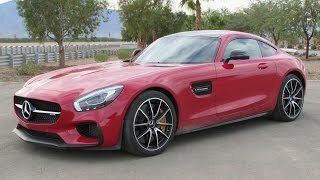 Mercedes and AMG gave halt to series of rumors about their new sports car intended to replace SLS AMG and one which will hold the features to compete with powerful Porsche 911. 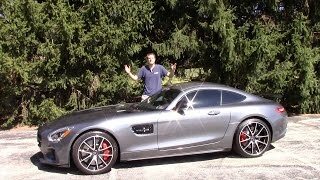 This happened with the release of all new Mercedes-Benz AMG GT 2016. This all new lighter and slimmer model is impeccably built to rule and this gets very well portrayed through its aviation inspired interior, classic exterior and power beneath its hood. Let us have a closer look at each of them separately. As we mentioned earlier, inside Mercedes Benz AMG GT 2016 you’ll notice entire cockpit flying around with ‘aviation theme portraying company’s modern and lightweight approach. Dashboard features a wing-like shape, while the center of it portrays some unique styled vents. Keeping all packed are concave shaped door panels, which look really impressive. Adding to the aviation inspired arena are low positioned seat and high mounted motorsport- inspired center console. Created with finest materials cabin features V layout arranged AMG drive unit controls, which are indeed a unique design followed. Apart from this, use of finest materials adjoining the leather covered sports seat, dashboard and door panels make the entire interior perfect amalgamation of class and comfort. Exterior of Mercedes Benz AMG GT 2016 features design that will bring a thought of it being a successor to SLS AMG. However the long hood, greenhouse and short boot will definitely ease your eyes. Starting with the front fascia of AMG GT 2016, first thing to come in your notice will be wide diamond pattern grille amidst stunning headlamps, which extends and make their way till fenders. Beneath are located thin air dams and large air intakes to provide fresh cool air to brakes. Further marching towards the rear fascia of Mercedes Benz AMG GT thin tail lights, a fleshy bumper and large exhaust pipes are at their position to provide your Mercedes AMG GT 2016 sporty look. Accompanying them at the top is a large trunk lid that houses rear glass. 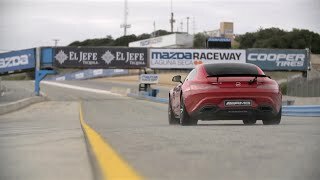 Mercedes Benz AMG GT gets its power through a 4.0 Liter V8 engine that delivers total output of 456 HP and 600 nm. However for those who need a little more to this, company brings for them another version, Mercedes Benz AMG GT S 2016 which delivers total output of 5.3 HP and peak torque of 650 nm, through same engine. 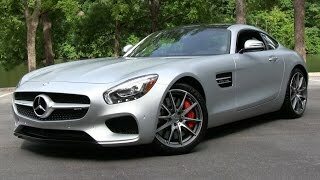 Talking about performance figures of Mercedes Benz AMG GT 2016, it reaches a top speed of 189 mph and can finish 0-60 mph sprint in just 3.9 seconds.